There are two places to add Login Authentication to your campaign: the Login Widget within the Campaign Builder and the Login field within the Form Designer. The Login Widget can be used to create gated content that only logged in users can view. 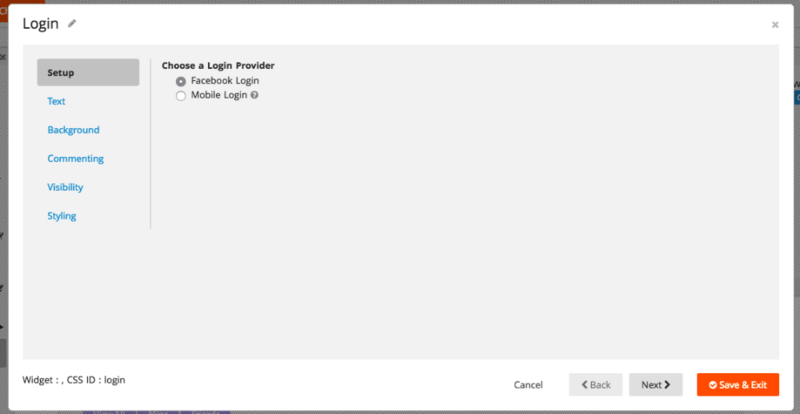 This article outlines how to use both the Login field and the Login Widget. The Login field in the Form Designer offers two ways to authenticate a user for the purpose of restricting repeat entries or votes. The two options are Facebook Login and Mobile Login. When a user clicks the "Log In with Facebook" button on the live campaign, a popup will appear prompting the user to authenticate with Facebook. The only information collected from this authentication on the ShortStack side is the app-scoped ID. When a user clicks the "Log In with Mobile" button on the live campaign, a popup will appear prompting the user to enter their mobile number. Once they click the submit button, they will be sent a text message to their phone with a 6-digit code. Entering the correct 6-digit code will close the popup and log the user into the campaign. The user will remain logged in until they choose to manually log out of the campaign. Note: Phone numbers submitted by users are NOT stored in ShortStack's system. Add a Login Widget to your campaign within the Campaign Builder. Within this widget, choose a Login Provider — Facebook Login or Mobile Login. Add a Login field to your Form within the Form Designer. The Login field offers the ability to Hide login button; this should be selected if you are also using a Login Widget on your campaign so there aren't duplicate Login buttons on your campaign. A reason to hide this button is if you're using a Login Widget to gate any content; for example, hiding a Voting Widget behind a Login Button. In this instance, having two Login buttons isn't necessary, so you can choose to hide the field button while still keeping restrictions in place. Use the Logout Link Text field to customize the text users will see when they are logged in to the campaign and want to log out. Add a Login field to your Form within the Form Designer. Select the Facebook Login radio button. Add a Login field to your Form within the Form Designer. Select the Mobile Login radio button. When a campaign using the Mobile Login field is published, a Mobile Login Client is automatically configured. This client is similar to a Facebook App; it's how the Log In with Mobile identifies what the user is trying to log in to. The name for the Log In with Mobile Client defaults to the campaign name, but you can change this at the end of the Publishing Wizard, or later in the Campaign Settings.